British new car market stable in February, rising 1.4% following January dip, marking solid start to 2019. 81,969 new cars registered on UK roads in the quietest month of the year ahead of crucial March plate change. Demand for alternatively fuelled cars rises 34.0%, marking 22 consecutive months of growth as buyers respond to growing model choice. The UK’s new car market enjoyed marginal growth in February, up 1.4% following five straight months of decline, according to the latest figures released today by the Society of Motor Manufacturers and Traders (SMMT). 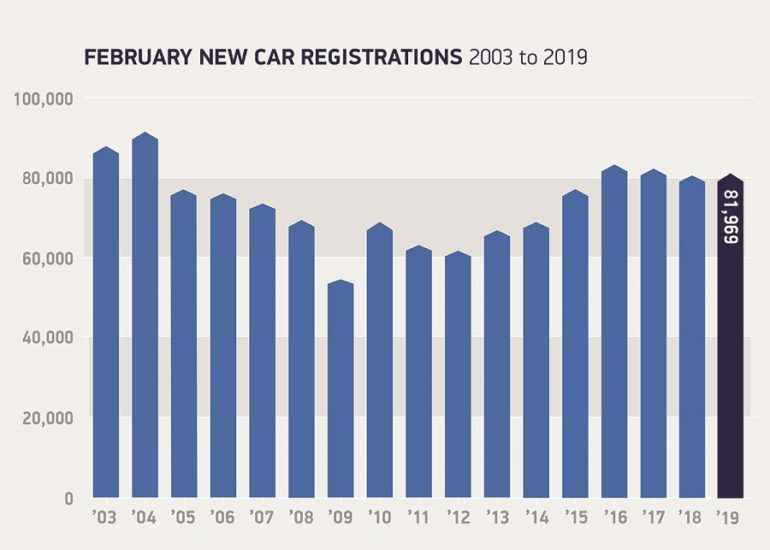 81,969 new cars were registered on UK roads in the month (a year on year uplift of 1,164 units), traditionally one of the quietest of the year, ahead of the crucial March plate change. 22nd consecutive month of growth for the segment as new and existing models cutting-edge attracted buyers into showrooms. Registrations of zero-emission electric cars enjoyed particular growth, more than doubling to 731 units, although they still accounted for less than 1% of the market (0.9%). Meanwhile, in the four months since the October 2018 reform to the Plug-in Car Grant, the market for plug-in hybrid electric vehicles (PHEVs) has only grown by 1.7%, compared with 29.5% over the first 10 months of 2018.1 This suggests that removing the incentive for PHEVs is having an adverse effect. The news comes as vehicle manufacturers prepare to launch some 14 all-new electric and plug-in models to a global audience at the Geneva Motor Show today. Already there are around 40 plug-in models on the market in the UK, with more than 20 more expected to arrive in showrooms in 2019.